Alert Training UK Ltd aim is to help and support every learner to achieve their full potential. Our IAG (Advice and Guidance) is available to prospective learners, those on programme and others including employers free of charge. 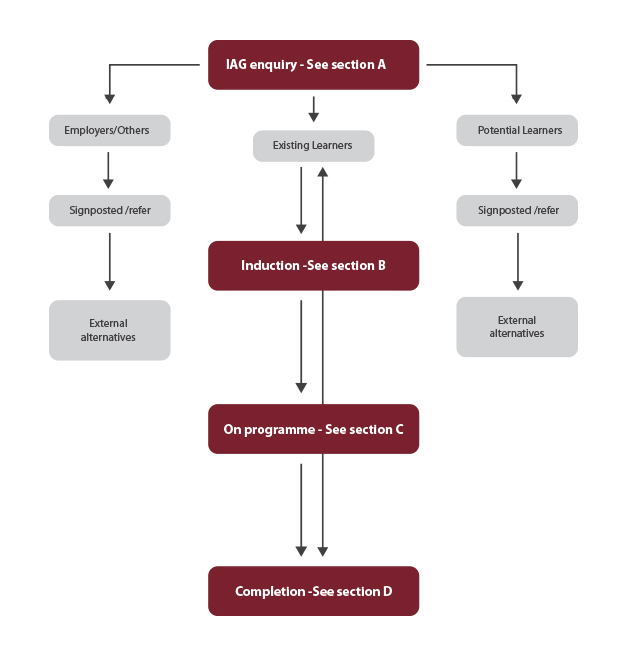 The following model represents how IAG will be managed throughout the learning journey and supporting explanations of the key sections. Addressing equality and diversity by being enabling and responsive with a “can do” approach. To provide all learners and potential learners with information and advice that empowers them to make self-determined choices about learning and work. To provided employers and other interested parties with information, advice and guidance that assists them in the direction and choices they make regarding learning and work. To actively promote the provision of information and advice that meets the matrix Standard throughout the company and for all stakeholders.